Jolly fled for safety to the car ahead of hers, but it too was abandoned. She ran on. The rubber on her shoes melted into the asphalt. The back of her scrubs caught fire, blistering her legs. She tried another car, but it wasn’t moving. The 90-minute event — scheduled from 7 p.m. to 8:30 p.m. on Dec. 3 — will be held at the Capitol Visitor Center Auditorium in Washington and broadcast over Facebook, YouTube and Twitter by seven progressive media outlets. Here’s the reality: unless the next Democratic president makes combating climate change a central feature of his or her platform (seriously combating climate change, not the half-measures and committees put forth by Democrats swimming in oil money), we’re all doomed. Hell, some scientists give our species a 50-50 chance of surviving the 21st century. This is really the only thing that matters, because if we don’t have a habitable planet, none of the policies we want to put in place will have the impact we want them to. We’ll all be literally running for our lives on a planet which is becoming increasingly hostile to life—not to mention the fact climate change is estimated to cost the planet $54 trillion under our current course. (To put that figure in context, the GDP of the entire globe in 2017 was $75 trillion.) 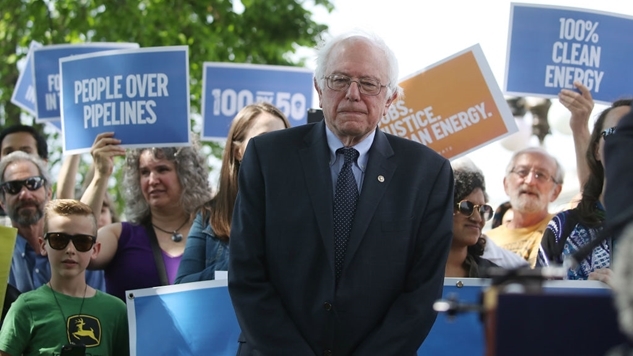 If Bernie Sanders is the only Democrat willing to put aggressive climate policies like the Green New Deal on his platform, then he’s the only Democrat who deserves to win in 2020. Period.